It is the story of radical Christian Pietists who created one of the most extraordinary books of colonial America, the Märtyrer Spiegel (the Martyrs' Mirror). This book is the largest book printed in colonial North America, and is often considered the most ambitious American printing project of that era. This gargantuan printing project was supervised by Johann Peter Miller, a premier linguist and scholar of early Pennsylvania. Peter Miller attended the University of Heidelberg, Gemany. He was one of the greatest linguists in the American colonies at that time. 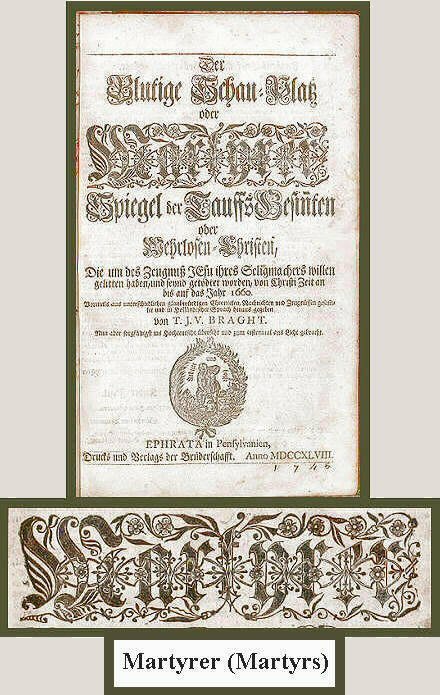 Peter translated this Martyrs' Mirror from the original Dutch to German, because this book had been requested by Pennsylvania's German-speaking Mennonites. These ambitious printers eventually printed 1,300 copies of the Martyrs' Mirror. Each book contained more than 1,500 folio pages. That's more than a million and a half pages, all hand-pulled on a creaking, wooden press. (1,950,000 pages). No small accomplishment! Legend has it that Peter Miller slept only three or four hours each night during this printing project. I hope they allowed him cat-naps at noon. 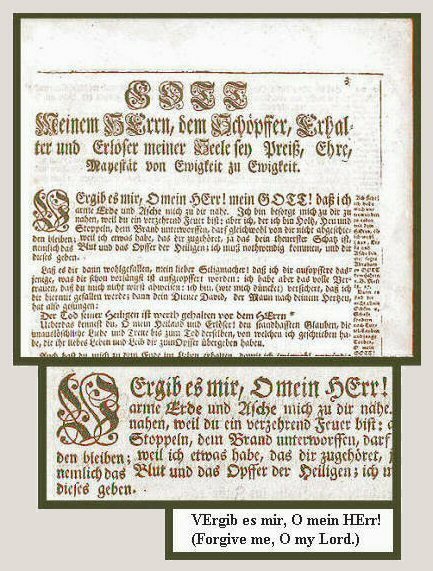 Above: The 1748 Märtyrer Spiegel (the Martyrs' Mirror) is an extravaganza of blackletter typography. Within 30 years, Germantown printers would master the art of casting their own fonts, to create the first books printed in America with our own American-made types. Above: This beautiful Martyrs' Mirror binding is a knock-out. 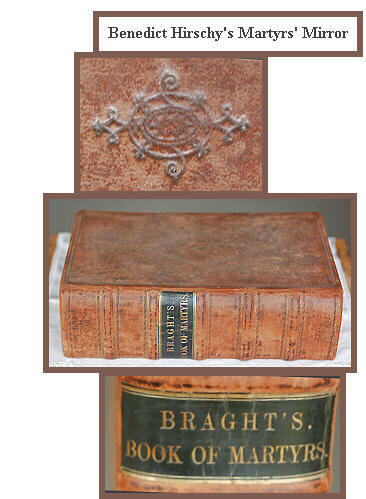 It is the best binding I have seen for an Ephrata martyrs' book. This brass-and-leather masterpiece feels heavy and Medieval, like the thick blackletter fonts inside. It looks like Jakob Böhme's alchemy manual. This Martyrs' Mirror was bound for the Christian Meyer family, around the time of its publication in 1748. Christian Meyer was a wealthy Mennonite farmer in Manheim Township, Lancaster County. 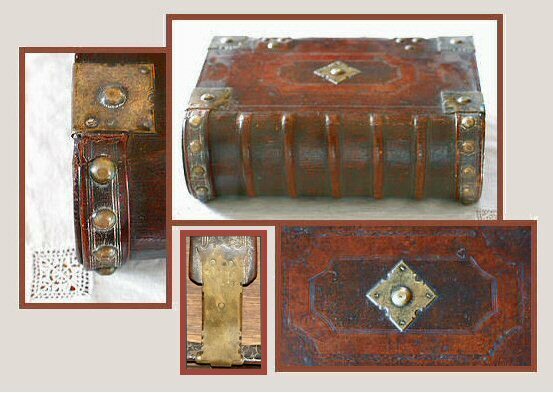 This binding probably was created in the Ephrata Cloister bookbindery. Above: Anonymous Cloister members used quill pens and ink to inscribe the flyleaf of this Martrys' Mirror with the name of the book's owner, Benedict Hirschy (Benjamin Hershey) (born 1697 - died 1789). He was a prominent Mennonite bishop in Lancaster County. Hirschy and his parents immigrated here from Friedelsheim, Germany in 1719. His 500-acre farm includes the land that is today's Conestoga House, the historic family home of the Steinman family, owners of the Lancaster Newspapers today. This same Benedict Hirschy (Hershey) was the great-great-great grandfather of Milton Hershey, the founder of the Hershey's candy company. 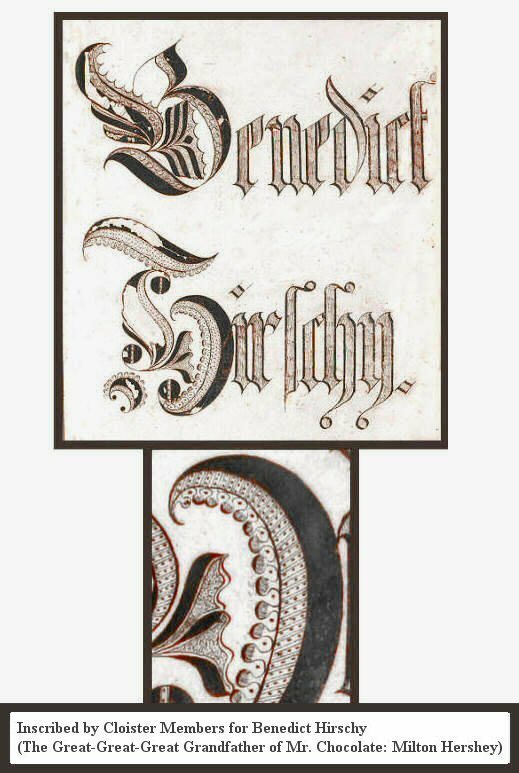 This is the first time this Hershey fraktur has been published or exhibited. It is great fun to showcase it here. P.S. Milton Hershey was a printer's apprentice, before he became a candy maker. 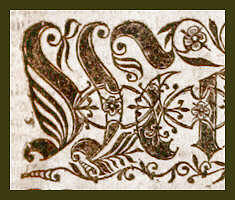 Fortunately for chocolate lovers everywhere, Milton failed miserably in his short-lived printing career. Above: The Martrys' Mirror of Mennonite Bishop Benedict Hirschy (Benjamin Hershey) The Hershey family had this book rebound in this binding in the early 1800s. The Hersheys chose to Americanize this book with an English-language spine label. Medieval binding was Out; Anglicized binding was In. Out with the old. In with the new. Above: 1920s - 40s postcards of Ephrata Cloister buildings. Plus a reenactors postcard by Mel Horst.